I had this buttercup squash (perhaps the funkiest looking squash of them all), sitting on my countertop for the longest time. It likely would have become soup had it not been for the name itself – “buttercup” which spoke to me and said: let’s make a crumbly & buttery dessert! I won’t go as far to say this is healthy, but hey, it’s the holidays and we’re making dessert, so let’s live a little. These bars are made with good quality organic ingredients (and remember: squash). This recipe is loosely based on my recipe for raspberry crumble bars. I switched out the jam filling for a wintery buttery squash puree using Organic Valley Butter, plus a good amount of chocolate chips and snowy shredded coconut. 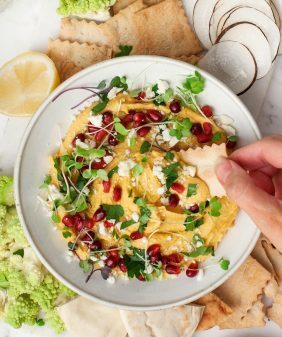 If you can’t get your hands on a buttercup squash – not to worry – this recipe works just the same with butternut squash, pumpkin and even mashed sweet potato. (I’ve made this one a lot lately if you couldn’t tell). These bars are made with a walnut crust. The squash is smoothly mashed with butter, maple syrup and pumpkin pie-like spices… They’re sweet, but not too sweet, and I find them to be quite filling – although after we snapped the photo I turned around, and Jack had inhaled 5. For the squash butter puree: (Note: this step can be done in advance). Cut a buttercup squash in half and scoop out the seeds & insides. Place the squash cut side down on a foil-lined baking sheet and drizzle just a tiny bit of water inside the foil (fold the edges of the foil up a bit so it won’t leak). Poke a few holes in the top of the squash and roast until it’s soft and a fork easily slides in and out. About 45 minutes. Let squash cool then scoop the flesh out from the skin and discard the skin. Mash together 1 cup of the soft squash with the butter, maple syrup, cinnamon and salt. Stir until smooth. (Taste and add more maple and/or spices to your liking - it should taste pumpkin pie-like). Store puree in the fridge until ready to use. For the bars:: Line an 8x8 (or similar size) baking dish with parchment paper. 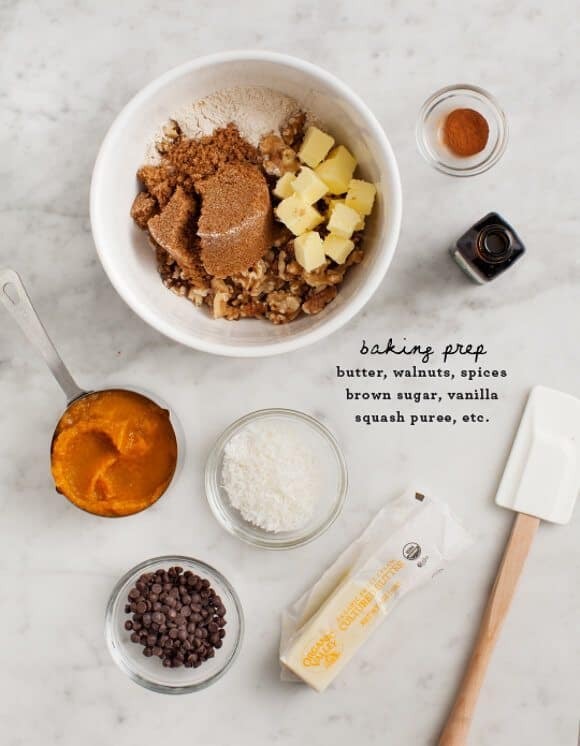 In a food processor pulse together the flour, walnuts, brown sugar, butter and salt until it becomes crumbly. (Similar to the texture of wet sand). If the crumble is too dry, add a few drops of water and pulse again. Scoop ½ cup of the crumble mixture and set it aside to use later for the topping. Spread the squash puree evenly over the pre-baked crust. Top with chocolate chips, shredded coconut and the remainder of the crumble mixture. (Optional: bake 10-15 minutes more to toast the topping and melt the chocolate). Chill bars in the fridge for at least a few hours to set before slicing. To slice, use a knife to gently loosen the edges, then (very) carefully lift the parchment paper out of the pan. Use a sharp knife to slice bars into 1x2 inch rectangles. Enjoy, then store remaining bars in the fridge. This post is sponsored by Organic Valley, thank you for supporting the sponsors that keep us cooking! This crumble looks divine! I love the use of buttercup squash. Yummo! I LOVE that video you guys made! So creative! 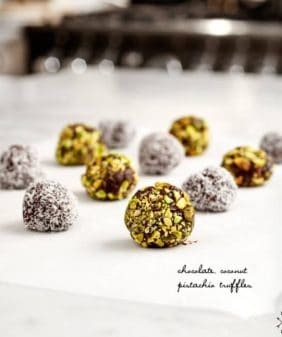 These sound delicious and like the perfect sweet bite. These bars sound flipping perfect! Love this idea. These look amazing. I am going to definitely given them a try once the holidays settle down. Pinned! can’t wait to try these. Yummy! Can’t wait to try it. What a great way to get those yellow veggies into dessert. Thanks for sharing this recipe! I tried it with sweet potatoes and they were superb! This looks and sounds incredible! I’ve never met a buttercup before, but I think dessert would be the perfect introduction. Thanks for sharing! These sound great. I might try a GF version after the holidays! 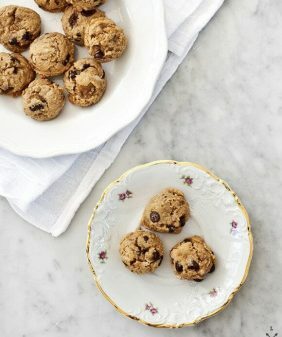 What might be in your gluten free recipe? This is meant to be a 100% compliment. I saw the photo and read the recipe name and then said out loud “You saucy minx.” I cannot wait to make this for my holiday party tomorrow night! Love video! These bars look amazing! These photos are artwork. So pretty! These look delicious! 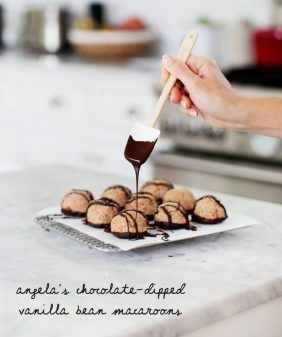 I can’t wait to make them for the holidays. LOVE the video!! Do you think vegan butter like earth balance could be substituted? This looks and sounds so amazing. I love that you used buttercup squash in it. The name is just too perfect. 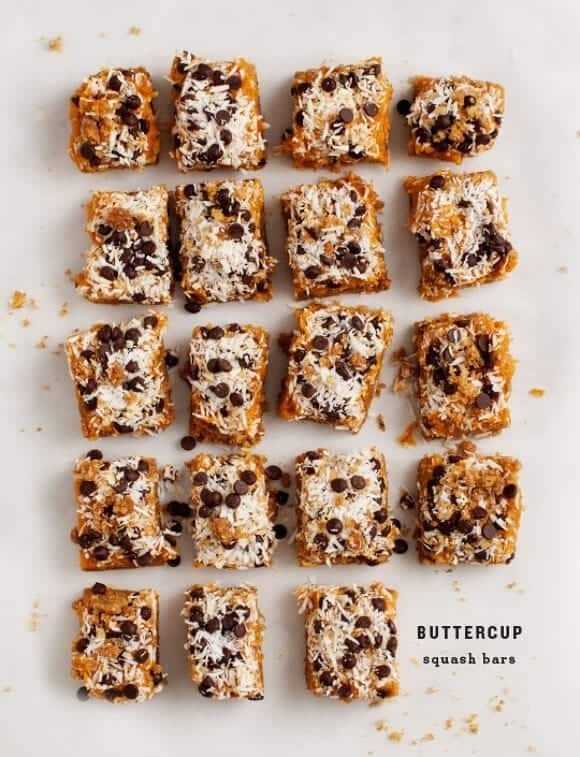 I need to pick up some squash because I am really craving these bars! I always enjoy your videos. And I have made your raspberry walnut bars several times, so I’m all over this squash/pumpkin version. What do you think about adding an egg to the squash butter puree to make a more set custard texture? Nice & creative. A must try! these are so beyond epic! 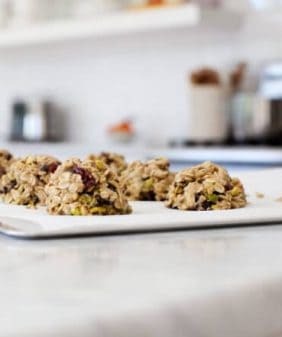 what is the baking time for the bars? These sound absolutely yummy! You bake the crust fully, for about 20 minutes (in step 6) and then you can, if you want to, bake them just to toast the topping a little (10-15 minutes). The most important part is that they chill in the fridge to set up before slicing. So, the squash mixture, once poured into the pan, does not need baking? nope, the puree should be a little on the thick side (which is why I don’t recommend canned pumpkin puree) and then it firms up more in the fridge. What a delicious combo. I love anything in the squash family, especially when combined with walnuts= win and win. 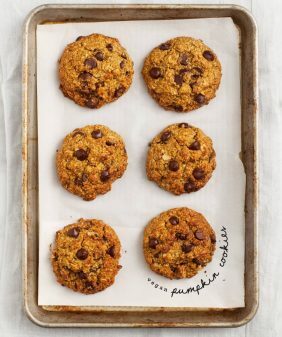 Just made these with sweet potato and I am IN LOVE. These bars have become a Thanksgiving staple! I have to use a plane gram cracker crust because my husband is allergic to nuts, but everything else is awesome and we love them! OMG, my spelling! Plain and Graham, sorry! !